Chef Jeenas food recipes: Is Mango Lassi The Best? Is Mango Lassi The Best? I had my first Mango lassi in US a few years back!! Its my best pic in the restaurants here. IT IS THE BEST! I am not Indian, however this is one of my favorite drinks. 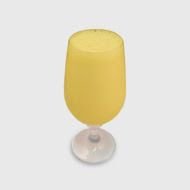 It also has sentimental value for me because my husband introduced me to mango lassi while we were still dating. I love mango lassi. I basically dont like Lassi. I know it s funny but yes I never liked buttermilk with sugar. I like others with mangoes like mango malai and mango milkshakes. It is the best tasting but it's very very sweet and not so good for you,specially if they make it from the can with loads of sugar.Home made is lot better. still, its one of the faves! Mangoes to a Gujarati(Gujarat, India) is like potatoes to Irish. Mangoes for me is the king of all fruits and Mango lassi, I just love it. I prefer mine homemade with fresh or frozen mangoes. And not canned ones. I have also posted recipe for Mango lassi on my blog. My favorite is the white plain sweet lassi. Try it I guarantee it is better than the mango lassi. Plain sweet lassi is the best. You would think that the mango is the best but sweet is better. If you havent tried it you will be surprised.